Born amid the bigotry of the Deep South, mixed-race Joseph is a slave in all but name. Separated from his mother at birth, he yearns to run away from his loveless home and find her. It’s a journey that will take him from plantation to plantation and hardship to hardship, yielding joy, sorrow, and love along the way. Years later, Joseph’s son, Isaiah, faces his own journey: coming to terms with his homosexuality. But society is still slow to accept change, and Isaiah fears rejection from even those closest to his heart. 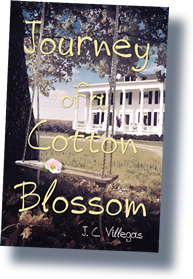 From 1940s Mississippi to the civil rights era of the ’60s and the push for LGBT equality, Journey of a Cotton Blossom follows three generations of a family fighting for liberation. J. C. Villegas paints an eye-opening story that will inspire readers to open their hearts to love. Though her characters face different types of discrimination, they all draw strength from love and from their faith in God. Can Joseph find the mother he has never met? Can Isaiah survive injustice and adversity? And can they each learn to love themselves in the face of a world that challenges their right to exist? Check out the author’s latest interview and fan Q&A. 3.2.2019 | DAHLONEGA LITERARY FESTIVAL | 11:30 A.M.-6:00 P.M.
10.20.2018 | FORT WORTH BOOK FEST | 9:30 A.M. - 6:00 P.M. When she’d worked in that field like an animal, she would, for a while, lose her will to live; then she would look up at the beauty and the life that the flower held in its soft petals. She admired the flower and respected its strength. It symbolized everything she was as a person. She could look past the negative and see the beauty in everything. Turning book sales into support for the Campaign for Southern Equality, the author makes it simple for readers to give back. For every copy purchased via JCVillegasBooks.com, 10 percent of sales will be donated to CSE, a human rights initiative working across the South to promote full LGBT equality; visit SouthernEquality.org to learn more and make additional contributions.